My wife and I are a couple of weekender’s that love to explore the outdoors. The Dutchmen Rubicon Toy Hauler is a perfect fit for our family needs, and we have had it for about 9 years now. We can fit the Golf Cart, Motorcycle, Teenager, and 3 dogs in it comfortably and spend a full week dry camping or “boon-docking” easily. I started this site – Best Summer Life – to share our RV camping experiences and journey with others to inspire and help shortcut some of the mistakes that I have personally made along the road. Can a Salvaged RV be insured? RV Rentals: How much does it cost and why? RV TV’s: Smart, 12V, and LED. What is all this?? One of the biggest and most obvious challenges there is to camping in an RV is money. It doesn’t matter if you are living out of your RV as a “full-timer” or a “weekender” like we are. Money is a constant challenge. Here is a helpful list of 101+ Ideas to make money while on the road that you can use to start making more and having more fun out there. I’ve made a lot of mistakes so far while traveling and camping. The most notable of the bunch was hooking up the fresh water line to the black tank clean out valve and letting it run until water was shooting out of the top roof vent! If I would have had this guide when I started, I might have saved myself a LOT of money and quite a few man-points. 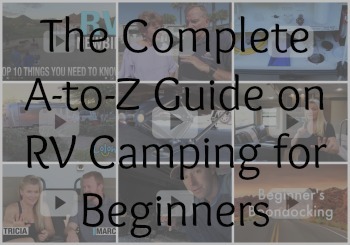 Check the Complete Guide to RV Camping for Beginners here.